There is so much going on the running world this week, with the Boston Marathon and so many other spring races happening after a long, cold winter of training. I thought it would be fun to talk about some of the headlines going on in the running world and voice our opinions about the topics. I hope you'll follow along and leave your comments in the section below. Kind of like an on line session of The View: Running Edition. This story is crazy! 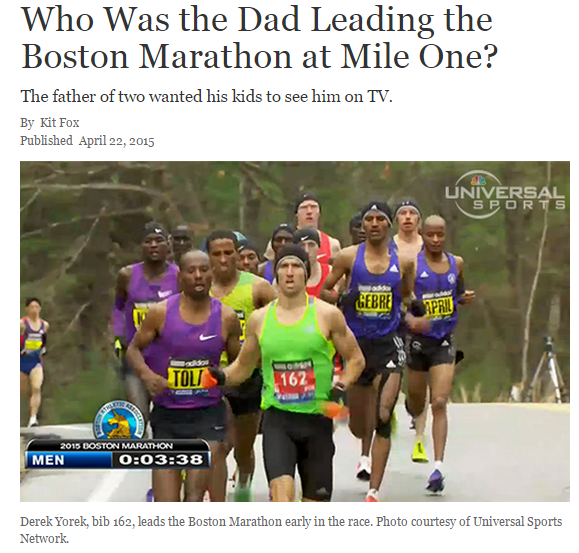 A Dad from Texas decided to lead the first mile of the Boston Marathon! Why did he do it? He wanted his two little girls to see him on TV! He ran the first mile in 4:38 and then proceeded to run a painful, long, hard, cold way to the finish. He went on to finish in 3:04 (pretty impressive, considering! ), but it was definitely a painful experience. So tell us: What do you think of his stunt? Would you do that for your kids? My take on it: Wow. I think it shows how much he loves his girls and he really wanted to have that moment for them. It'll definitely be an experience that the family will never forget! I am so happy that he was able to finish and also that he respected the elite athletes space. Would I do it? I don't think I would be gutsy enough to try something like that and I would be so afraid of having a DNF added to my name or worse - injuring myself! 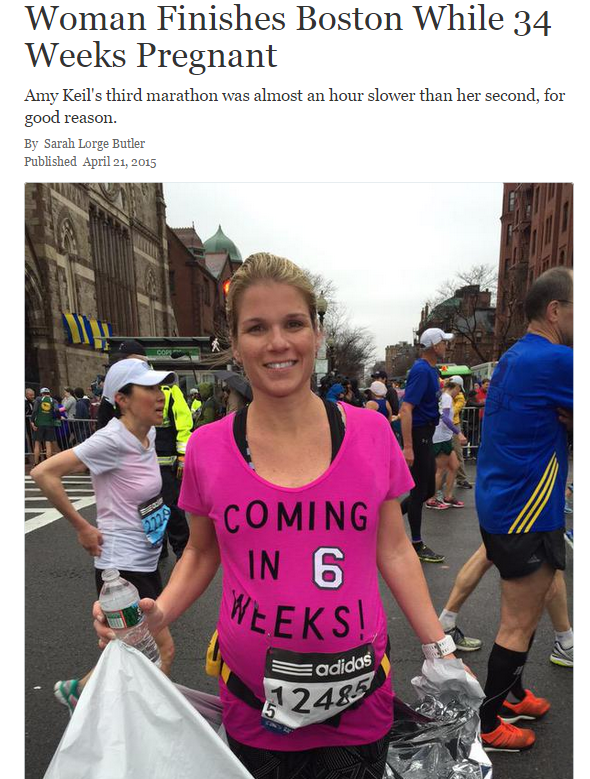 Check out this story: a women who is 34 weeks pregnant runs the entire Boston Marathon! She finished in 4:19:14 and felt fine afterwards. She also got her doctor's permission to run. So tell us: If you were that far along in your pregnancy, would you run a marathon? My take on it: Well, I am very biased on this topic, because I had super difficult pregnancies and could not run at all during any of them (I ran the first trimester with my oldest). I was on bedrest and had them all early. BUT, if that wasn't the case and I had normal pregnancies, I think I would have to say no. 34 weeks is really far along and I think you shouldn't be doing something to stress your body to that extent. Especially when you get to the Newton hills!! You have plenty of time to run a marathon! 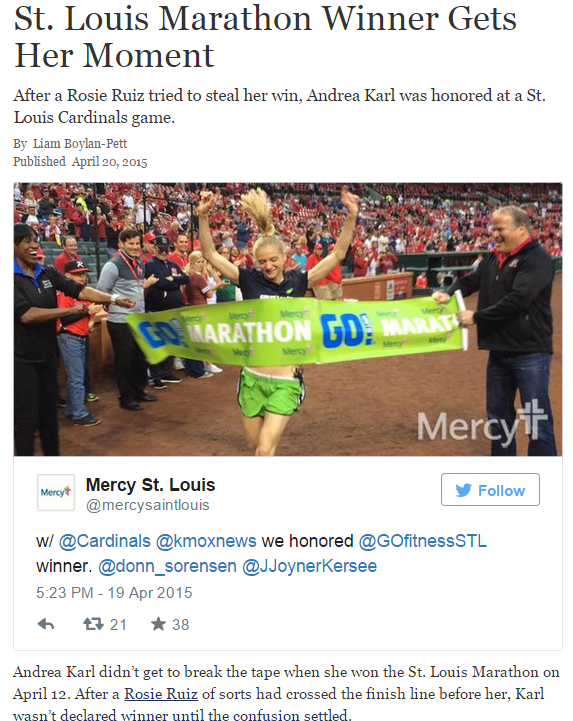 Next story: A women cuts the St. Louis marathon course and cheats her way to becoming "the winner". The race officials soon found out that she was a fraud and disqualified her from the marathon. Boston Marathon officials also DQ'd her from racing in Boston. Meanwhile, the true winner gets her chance to cross the tape at the Cardinals game!! So tell us: What do you think should happen to the cheater? How long should she be banned from future races? It turns out she has done this before. My take on it: Ugh. This is horrible! There has been talk of the cheater having mental issues. Maybe that is just speculation, but I think she should be banned from competiton for at least two years. I also think all race cheaters should be on a "most wanted" type of list that goes to all race directors. It should have their picture and information so they can be denied entry if they try and sneak into a race. The happy part of this story is that the REAL winner got to break the tape (after her victory lap) while Jackie Joyner Kersee held it as she crossed! She also won $1,500. Good for her!! 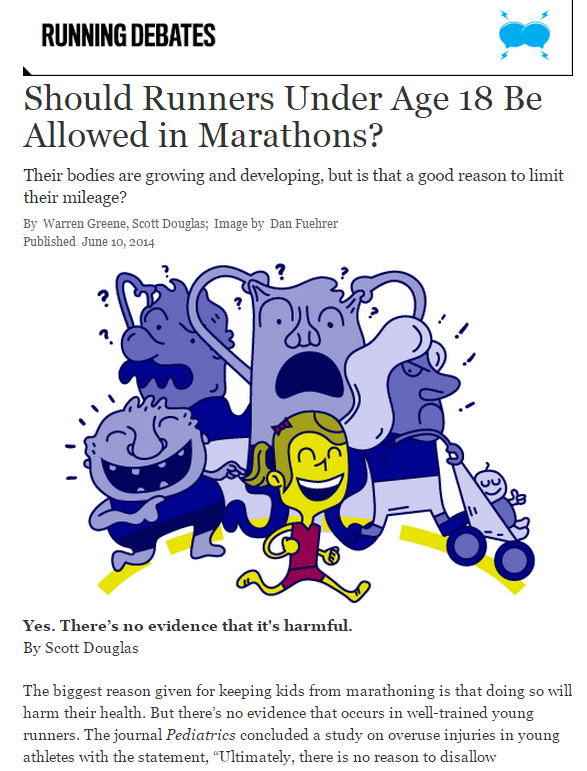 The debate: Should children under the age of 18 be allowed to run marathons? There is no real evidence that shows that running this distance is harmful to children. So tell us: Would you allow your young teen (let's keep it ages 12-15) run a marathon? My take on it: Although there is no concrete evidence showing that it is harmful to children, I think we don't know enough about the long term effects on their growing bones. Training for and running a marathon takes a lot of running (pounding on the body) and it would seem to me that it might be too much for a young teen. With that said, I do love the idea of kids running 5 and 10ks with their parents. I think it promotes a healthy lifestyle and a fun family activity. Final Answer: Not for children under the age of 16. Alright friends! Thanks for participating in this roundtable discussion! I hope you have an awesome day and please run some extra miles for me!! Stay tuned - I'll be talking about a day in my life after knee surgery.